As anyone who has been a part of a successful operation can confirm, businesses are usually bursting. They’re full of all the usual things – people, furniture, and stock – but, most of all, they’re chock-full of paper. Go into any restaurant and you’ll find a massive paper trail of receipts, important documents and records jam-packed into an ill-equipped filing cabinet. Hygiene Audit Systems, a food and health safety consultancy, has created an answer to this out-dated approach to food safety management. Dubbed Hawk, the online food safety management system gives those in food and hospitality sectors an orderly place to view, manage, and compile records. Hawk cuts down on paper in a big way, by monitoring safety concerns online and formatting the data into easy-to-access information. Working as a central hub, Hawk houses all food safety information and recordings online. As a system, Hawk is fully customisable. For example, if staff is on top of fridge and freezer temperature checks, it may not be necessary to have Hawk remotely monitor them. 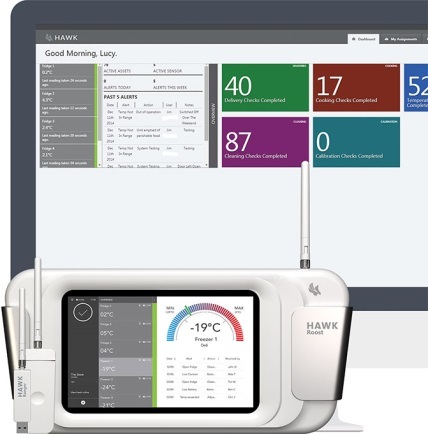 However, if you’d like to take that responsibility out of staff hands – a time, effort, and money-saving solution – Hawk manufactures its own sensors and hubs designed to automatically record temperatures. Following the same, hassle-free technology, Bluetooth probes (standard and fast response) keep track of critical control checks. Monitor – keep track of temperatures in multiple fridge and freezer units, receive a notification if unit temperature goes outside of pre-defined temperature range (SMS/email), orderly information presented from multiple units including past data, and with 24/7 accessibility. Checks – store all records and use “quick and easy” forms so as to not affect food preparation. Incidents – quick response and information collection during incidents, keep a log of incidents, and use visual content to show all aspects of incidents to assessors, inspectors, and insurers. Checklist – digitise checklists to create an easy-to-monitor database, and check on what hasn’t been done in real time. Audits – a thorough checklist with “added oversight and reporting,” create a customisable audit template, track progress and results, create customer reports for your business, create tasks from audits and assign to staff, and upload related photos and documents to central hub. Predictor – gives a Food Hygiene Safety Rating prediction in a way that will not influence staff to change the score. Why would a business owner choose to overhaul a tried and trusted method of operation? If it ain’t broke, don’t fix it is a popular phrase used to stamp down innovation. Hawk is everything that the food and hospitality industry has been waiting for. As a paperless solution, it is environmentally sound, setting your business apart and saving money in the process. Time too is saved by eliminating cumbersome paper records. It cuts down on tasks an employee must juggle throughout the day. Audits no longer need to be emailed with Hawk in charge. Hawk is able to monitor things 24/7, offering real-time alerts by SMS or email if a unit is behaving oddly. Any corrective actions are logged. Information is backed up and can be created as far back as desired to show a complete history. Everything is accessible at anytime from anywhere with an internet connection. The system is fully customisable. Thanks to its modules, users are able to choose the elements that work best. Templates and formats for pre-existing operations do not need to change. Hawk works within these parameters to provide data. Multiple locations can benefit from Hawk as the system allows for monitoring across all locations. It works for local mom-and-pop restaurants, but can also effectively hold an international enterprise within its berth. Whether local, national, or international its functionality is consistent. Content can be stored in any way that works: image, text, audio file, video, and more are compatible with the system. 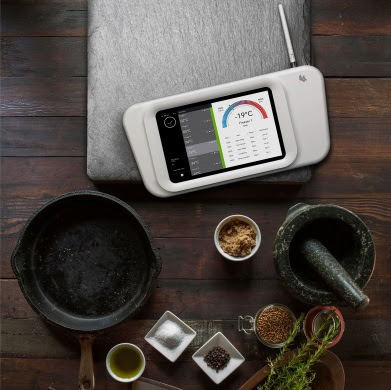 Of moderate importance is the fact that, “Hawk is an online health and safety management, HACCP compliance recording and monitoring solution.” This marks it as a viable option for all businesses in food and hospitality. It removes the human element from the equation, doing away with the potential for inaccurate or erroneous information. Complying with safety regulations is made easier and less time-consuming with Hawk.